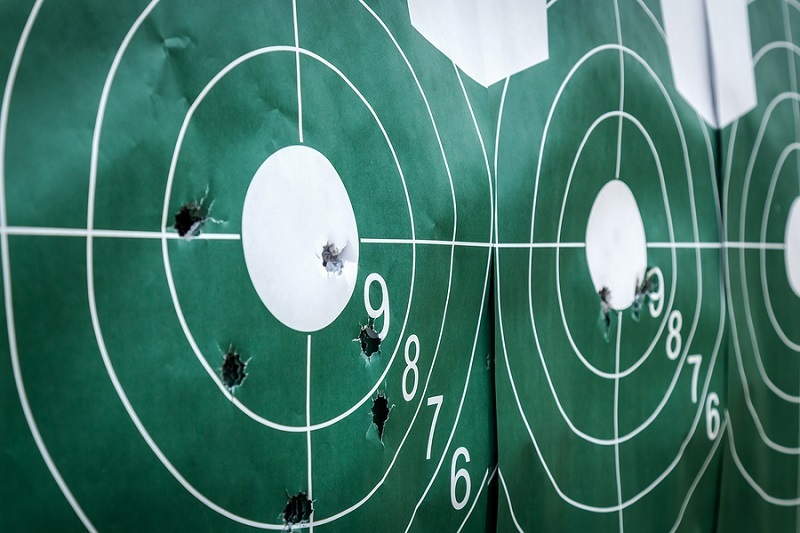 Whether shooting practice is for defensive purposes or just having fun at the range, a good tip on improving is to make better use of the front sight while shooting. More importantly, it's one of the best methods for practicing defensive shooting. While it isn't the end-all, be-all for handgun shooting, it's one of the most valuable tools to have in the toolbox, so to speak. The traditional method of aiming should be fairly familiar to most people: align the front sight with the rear sight and then fire. This is what most people are taught (I know I was) and there is a very good reason for it. Most shooting involves very basic physics. An object is propelled through a tube at high velocity and directed at another object. The sights sit on top of this tube and the top of the front sight is roughly the same height as the notch in the rear sight. Thus, if these two are aligned, the barrel is level (or close to it) and results in a truer trajectory. Pretty simple, right? In theory and in practice, it's an easy, effective method at getting the bullet close to where you want to put it on the target, just like good gun belts are an easy, effective method to achieve secure every-day carrying. The hitch is that most people tend to focus on the rear sight, aligning the front sight with the rear. Why is this bad? The human eye can't focus on something close up AND something far away at the same time. Focusing on the rear sight puts your attention on the thing that's furthest away from the target and furthermore, if the front sight moves during the trigger pull - up, down or sideways - that throws the bullet's trajectory off and makes the shot less accurate. If one uses the front sight instead of the rear sight as the point of focus, it ensures the target at least stays in the line of fire. If you're shooting at a concentric circle (bullseye) or a silhouette target, focusing on the front sight for sight acquisition and sight alignment should tighten your groups up. This is why the "Front Sight Press" technique is popular, with sport shooters and in the armed forces. This technique uses the front as a focal point, with the shooter bringing the rear sight into alignment with the front sight while focusing on the latter. There's a popular shooting technique in defensive shooting called the "Flash Sight Picture," which makes heavy use of the front sight. It's widely associated with Jeff Cooper, more or less the father of modern handgun techniques, though Cooper hardly invented it. Cooper's influence is deeply felt, as he is also the author of the four rules of gun safety. Others recommended the same technique, but Cooper often gets the credit because he popularized it. The basics of flash sighting is to bring one's pistol to aim at the target and - as quickly as possible - putting the front sight on target. Ideally, you'll also bring the rear sight up into alignment with the front sight. The way Cooper taught it is to bring the pistol to bear on the target. As the pistol comes up to the line of sight, focus on the front sight. Align the rear sights with the front while maintaining focus on the front sight. Once the sight is acquired, fire. The goal is to acquire a sight picture, with the front sight on target, as quickly as possible. This technique is super effective at scoring center-mass hits at moderate distances, usually in the four to ten yard range. Targets beyond ten to fifteen yards, however, require a full sight alignment with a handgun. The value of the Flash Sight Picture has been repeatedly confirmed. 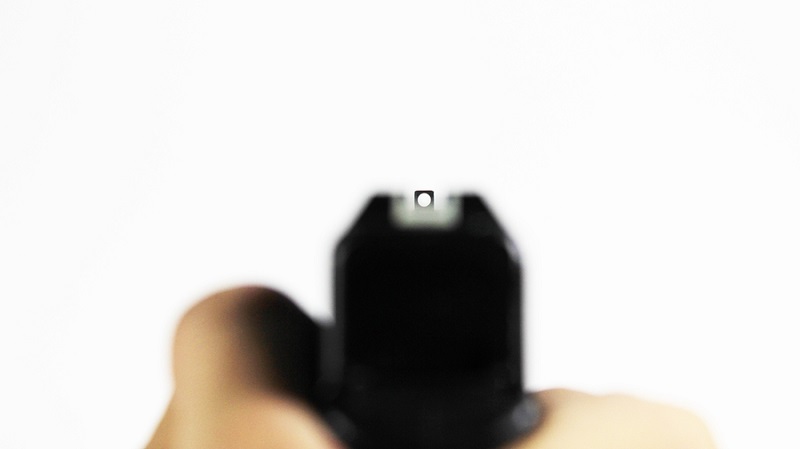 Studies have found police departments that teach this technique over alternatives (such as point shooting, or shooting use the point of aim of the pistol instead of the sights) reliably out-hit shooters trained in other methods at moderate distances. Numerous survivors of gun fights - especially law enforcement officers - have confirmed the flash sight technique's efficacy. Bill Allard, a veteran of the NYPD stakeout unit in the 1970s (along with Jim Cirillo, who famously survived every gunfight he engaged in, a number of which involved Allard as well) said he could see the front sights in such detail he could recall the serrations. Allard lived to retirement, and survived more firing encounters than his colleagues. Granted, other techniques have their place as well; point shooting is far and away more practical in close quarters (there's no time for sighted aiming) and a full sight alignment is necessary at longer distances. The thing about gun sights is that every technique of using them is a method for using a tool that has a particular use. Using the front sights as a focal point of sighting is a better method for overall sighting at moderate to long ranges, because it points the muzzle at what you intend to hit better than the rear sights. At very close ranges, you won't have time for the sights, so point shooting has it's use as well. For long guns, there's a value there as well. Shooting with a rifle with iron sights requires proper alignment to be accurate, and front sighting will help there as well. Most shotguns ONLY have front sights, so you don't have a choice with a scattergun. If you don't use your front sights in this manner, give it a try next time you head to the range. You may see improved accuracy at distance and faster, more reliable hitting if practicing hitting center mass closer-in. Just remember to start slowly - slow is smooth, and smooth is fast. I would like to see a video were the instructor is wearing glasses because I wear glasses and have a hard time focusing on the sights and the target at the same time. And would like to know what they do to overcome this.